September 24, 2013 (Honolulu, HI) – More than one-thousand of the best triathletes and trail runners in the world flocked to Ogden and Snowbasin Resort in Northern Utah over the weekend for XTERRA’s National Championship races. The weather was perfect, the course conditions ideal, and the local support un-matched as Ogden Mayor Mike Caldwell, the Utah Sports Commission, Snowbasin Resort, ENVE Composites, and the world-renowned volunteers from the GOAL Foundation combined to host one of the greatest weekends of XTERRA racing in event history. Ogden/Snowbasin Resort, UT (September 21, 2013) – The 2013 XTERRA USA Championship proved that there is no specific formula for success, especially when it comes to XTERRA experience. Leonardo Chacon took the overall title in his first appearance at the XTERRA USA Championship, and just the third XTERRA race of his career. Meanwhile on the women’s side, Lesley Paterson captured the title for the second consecutive year, continuing her amazing streak of XTERRA victories. The 2013 XTERRA USA Championship was staged in picture-perfect conditions on Saturday at Snowbasin Resort near Ogden, Utah. The off-road triathlon consisted of a 1,500-meter swim, a 28-kilometer bike and a 9.8-kilometer trail run. Although it is called the XTERRA USA Championship, the pro start list featured an international cast of stars. One of them was Leonardo Chacon, who participated in the 2012 Olympics and is considered a triathlon legend in his home country of Costa Rica. His XTERRA experience, however, was limited to a fourth-place finish at the XTERRA World Championship last year in Hawaii, and a victory at the XTERRA Mexico Championship this year. To make up for his relative lack of off-road experience, he trained in the mountains of Costa Rica. In particular, he found a trail that matched the elevation levels of Snowbasin (start at 4,900 feet above sea level, and reaching a peak of 7,300 feet). Chacon said his first XTERRA experience in Hawaii last year sparked his desire to improve on that fourth-place showing. “When I did XTERRA last year in Maui, I started thinking about improving my technique and see if I can be with these guys,” he said. Chacon completed the course in 2 hours, 32 minutes, 31 seconds – including the fastest run split at 39:57. He came out of the swim just seconds behind Australia’s Ben Allen, and had the lead for the first half of the bike leg. XTERRA veterans Conrad Stoltz of South Africa and American Josiah Middaugh (Vail, Colorado) eventually passed Chacon in the second half of the bike. At that point of the race, Chacon said he was content just to stay within sight of Stoltz and Middaugh. “I knew I could run a bit faster than them, and I attacked,” he said of his run split. Chacon and Middaugh were shoulder-to-shoulder midway through the run course before Chacon eventually turned it up in the final two miles and took the win by 57 seconds. Spain’s Ruben Ruzafa – another of the international stars to show up at Snowbasin this year – finished third in the USA Championship. It was his first time racing at the USA Championship, and just his second appearance in an XTERRA race in the United States, following his 2008 XTERRA World Championship victory in Hawaii. Ruzafa finished in 2:33:55, including the best bike split of the day at 1:21:37. The 40-year-old Stoltz placed fourth in 2:35:45, and said his racing style is not suited for the course at Snowbasin. “For me to beat them on this course, I need to have 110 percent performance and they need to have 90 percent performance,” he said. Rounding out the top 10 were, in order: Ben Allen (Australia), Bradley Weiss (South Africa), Nicolas Lebrun (France), Branden Rakita (Colorado Springs, Colorado), and Ryan Ignatz (Boulder, Colorado). There was a point early during Saturday’s race when Lesley Paterson actually thought she was having a “horrible” day, thanks to lingering effects of a cold she carried into the race. That she went on to beat the women’s field by 43 seconds to win the XTERRA USA Championship for the second consecutive year shows just how dominant she has been in the past two years. Paterson, 32, turned in the fastest bike split among the women and then held off 2012 Olympian Barbara Riveros (Chile) on the run to take the win. Paterson, who is originally from Scotland but now resides in San Diego, California, has now won the last two XTERRA USA Championships and the last two XTERRA World Championships. 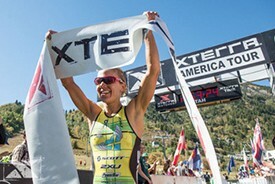 She has also won numerous races in between, and thus also took home the XTERRA U.S. Pro Series title for the second straight year. Once Paterson got into her rhythm, it was over for the other women. By the end of the bike leg, she was ahead by more than a minute. Her winning time was 2:53:21, including 1:36:38 on the bike leg. Riveros made up some ground on the run, but was never within striking distance of Paterson. Riveros finished with a time of 2:54:04, including the best run split at 43:26. It was just the second XTERRA race for Riveros, and she placed second to Paterson both times (also at the 2012 XTERRA World Championship in Hawaii). Chantell Widney from Canada placed third in her first appearance at the USA Championship with a time of 2:56:41. “This course really suited me with just tons of climbing,” she said. Widney finished the bike leg in fourth place, and said she could see Riveros ahead, but realized the gap was too significant. “I was just hoping to maintain third,” Widney said. Emma Garrard from nearby Park City, Utah, placed fourth in 2:59:07 for her best showing at the USA Championship. She did not participate last year while on a maternity break, and finished fifth in 2011. Danelle Kabush from Canada was fifth, followed in order by Carina Wasle (Austria), Suzie Snyder (Fredericksburg, Virginia), Melanie McQuaid (Canada), Shonny Vanlandingham (Durango, Colorado) and Christine Jeffrey (Canada). Also: Heather Jackson (41), Renata Bucher (37), Rachel Challis (34), Catherine Sterling (31), Brandi Heisterman (28), Genevieve Evans, Jaime Brede, Caroline Colonna, Tamara Donelson. Josiah Middaugh and Lesley Paterson capped off remarkable seasons on XTERRA’s pro circuit. Paterson went undefeated, while Middaugh’s only blemish was his runner-up performance today. They each received a check for $10,000 for the series title. Shonny Vanlandingham and Josiah Middaugh took home the honors of XTERRA USA National Champions for having the best seasons of American’s on the tour. The XTERRA USA Championship is not just about professionals. In fact, the age-group competitors make up the bulk of the field, and the two winners of this year’s race epitomize the amateur spirit. Matthew Balzer from Reno, Nevada, was the top overall amateur with a time of 2:49:50. He finished 12th overall, topped only by 11 established professionals. Balzer,, a former professional triathlete, took the lead in the amateur field early in the bike leg and stayed in front the rest of the way. He said he figured he was in a good position when he saw only the professional competitors with him in the bike-to-run transition. Despite the impressive victory, Balzer said he has no intention of returning to the professional ranks. He already owns two businesses in Reno – the Reno Running Company and MMS West (a mailing/shipping company). He also has a wife and two young daughters (8 and 5 months). “I have an amazingly supportive wife and two young girls, so I’m happy with where I am,” he said. Cole Bunn, a 17-year-old high school student from Bettendorf, Iowa, was the second amateur with a time of 2:51:11. He came in right after Balzer, good for 13th overall. John Mezger from Colorado was third in 2:53:57, and Bryce Phinney from Arizona was fourth in 2:57:15. In the women’s amateur race, Elizabeth Gruber from Redding, California, took top honors with an all-out effort. She finished in 3:11:13, and rallied from a deficit of more than four minutes out of the swim. Gruber is a nursing student at Loma Linda University, and was surprised that she finished ahead of standout teenager Hannah Rae Finchamp. “I was like seven minutes behind her at the West Championships, and that was the closest I ever got to her before today,” Gruber said. Finchamp, who won the XTERRA USA and World amateur titles in 2012, placed third this time in 3:14:51 and won the female 15-19 division for the third consecutive year. Julie Baker from Sonora, California, placed 14th overall and was the second female amateur in 3:13:28. Of note Cindi Toepel won her 9th XTERRA USA Championship title, Tom Monica his fourth, it was the third for Hannah Rae and Craig Vogstberger, and the second for Gruber, Gonzales, Colbert, Signoretty, and Karstrom. For more information click this link – XTERRA Nationals Press Guide – complete with racer profiles for both the XTERRA triathlon and trail run national championship races, course descriptions, schedule of events, past USA results, and more. Ogden/Snowbasin Resort, UT (September 22, 2013) – Patrick Smyth made quite the first impression on Snowbasin Resort and the XTERRA Trail Run National Championship. Although he lives in Salt Lake City – about 40 miles away from Snowbasin – Smyth had never been to the picturesque trails at Snowbasin until Sunday. All he did in his first XTERRA Trail Run was win the overall National Championship. “I’ve never actually been to Snowbasin, but always wanted to, so this was a good excuse to get up here and get on the trail system here,” said Smyth, 27. Lindsey Anderson, who made her first visit to Snowbasin last year and ran away with the title, successfully defended her women’s XTERRA Trail Run National Championship. She is the second female runner to win back-to-back XTERRA National titles, following Lauren Fleshman (2009 and 2010). Smyth didn’t just win the 2013 XTERRA Trail Run National Championship, he dominated. The former track and cross country star at the University of Notre Dame raced to the lead immediately and never relented. He completed the 21-kilometer course in 1 hour, 16 minutes, 38 seconds, which is the fastest time since the event moved to Snowbasin Resort in 2011. By the halfway point of the course, Smyth had established a 30-second lead, and the only runner within striking distance was Joseph Gray. Smyth continued to build his lead during the second half of the course, and even had time to get up and recover from a fall in the final two miles. Gray, who came over from Lakewood, Washington, for the race, finished second in 1:18:01. He was the co-winner of the 2012 XTERRA Trail Run World Championship in Hawaii, but this was his first experience running at Snowbasin for the XTERRA Nationals. Interestingly enough, the top five overall finishers were all first-time entrants to the XTERRA Trail Run National Championship at Snowbasin Resort. Karl Remsen from Leadville, Colorado, was third in 1:20:23, Mauricio Mendez from Mexico was fourth in 1:21:19, and Nathan Peters from Salt Lake City was fifth in 1:21:29. Mendez is 17 and just completed high school. He is an aspiring triathlete. He is the first runner under the age of 20 to finish in the top 10 of the XTERRA Trail Run National Championship. B.J. Christenson from Salt Lake City placed sixth, following third-place finishes in both 2011 and 2012. Rounding out the top 10 were Chris Gomez from Arizona, Ryan Matz from Salt Lake City, and Eric Koenig from Lutz, Florida. Perhaps just as newsworthy as Smyth’s victory was the 11th place finish of Max King from Bend, Oregon. King had won the previous five XTERRA Trail Run National Championships. King withdrew from his previous race in Poland last month due to an ankle injury, and it cost him some training time for the XTERRA Nationals. The women’s race turned into a duel from the start, with Anderson and Liz Stephen from Vermont running close to each other – and away from the other women – for nearly the first 20 kilometers. Anderson finished with a time of 1:27:46, which is the fastest women’s time since the event moved to Snowbasin in 2011, and nearly six minutes faster than her winning time of last year. Stephen came in right after Anderson at 1:28:12. Both Anderson and Stephen have represented the United States in the Olympics. Anderson participated in the steeplechase at the 2008 Olympics in Beijing; Stephen participated in cross country skiing at the 2010 Winter Olympics in Vancouver. Anderson is also a former star runner and current assistant coach at Weber State University in nearby Ogden. Stephen also finished runner-up at the XTERRA Nationals in 2011. She did not participate last year due to a schedule conflict. Maria Dalzot from Washington placed third in 1:39:59, and Corinne Malcolm from Bozeman, Montana, was fourth in 1:45:57. They were both making their first XTERRA Trail Run experience. XTERRA SoCal Series champion Margaret Shearer from Trabuco Canyon, California, was fifth in 1:46:34. Deanna McCurdy from Peachtree City, Georgia, was sixth in 1:46:41. She was running for Team Miles for Smiles, which is a charity running team that raises funding for research through the Foundation for Angelman Syndrome Therapeutics (F.A.S.T.). Rounding out the top 10 females were Genevieve Keogh from Layton, Utah, in seventh, Kristina Owen from Ogden, Utah, in eighth, Aimee Balzer from Reno, Nevada, in ninth, and Jaclyn Shokey from Jim Thorpe, Pennsylvania, in 10th. Although the elite runners chase the overall crown at the XTERRA Trail Run National Championship, the event remains an age-group race. Twenty-eight runners representing 10 different states and three countries took home age-group titles at the 2013 XTERRA Trail Run Nationals. The home-state Utah runners led the way with 10 champions, including Kevin Tuck from Salt Lake City in the men’s 55-59 division. Tuck, 57, was an impressive 18th overall, and this was his fifth XTERRA Trail Run National Championship age-group win. Amy Galbraith from Venice, California, won her fourth National Championship, this time in the women’s 70-74 division. Bob Evers (men 60-64) from Park City, Utah, and Hans Unger (men 70-74) from Sylmar, California, each won their third XTERRA National titles. On the young end of the spectrum, 9-year-old Jake Mackleer won the 9-younger division and became the youngest runner to complete the 21K course at Snowbasin. Other repeat winners from last year include Kaytlynn Welsch (female 10-14) from Alvin, Texas, Lindsey Anderson (female 25-29) from South Ogden, Utah, and Tamara Tabeek (female 50-54) from San Diego, Calif.
Tabeek competed in the XTERRA USA Championship off-road triathlon the day before. Also of note, XTERRA triathlon professional Nicolas Lebrun entered the XTERRA Trail Run National Championship for the first time and won the men’s 40-44 division. A day earlier, he placed eighth overall at the XTERRA USA Championship triathlon. All of the age-group champions received a free entry to participate in the 2013 XTERRA Trail Run World Championship, which is scheduled for November 24 at Kualoa Ranch, Hawaii. The 2013 XTERRA Nationals weekend was presented by the Utah Sports Commission, Paul Mitchell, AVIA, and the XTERRA Live More Card. Sponsors include Snowbasin Resort, GOAL Foundation, Gatorade, Rudy Project, PowerBar, KSL TV, ENVE, Zorrel, MediaOne of Utah, the U.S. Forest Service, XTERRA Wetsuits, LifeProof, Muscle Milk, Choice Hotels, Rockwell watches, FootBalance, XTERRA Fitness, and Wasatch Distributing. TEAM Unlimited is a Hawaii-based television events and marketing company, founded in 1988. It owns and produces XTERRA and in 2013 will offer more than 300 XTERRA off-road triathlon and trail running races in 18 countries worldwide. In the U.S. alone nearly 200,000 participants took part in the XTERRA lifestyle last year. In addition, TEAM TV has produced more than 300 adventure television shows resulting in three Emmy’s and 42 Telly Awards for production excellence since 1990. View samples at www.xterra.tv, and learn more at xterraplanet.com and xterratrailrun.com.